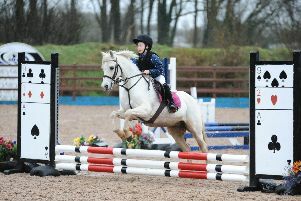 Working Hunter Classes for ponies and horses make a welcome new addition to Randox Antrim Show’s schedule this year. The show organisers are also pleased that it is a qualifier for the Bluegrass/NISA Clydesdale Championship 2018 and that its showjumping events are offering a total prize fund of £2,250. Declarations regarding Antrim’s show jumping event number five are to be made to the SJI online system by 4pm, Thursday 28 July. Randox Antrim Show, takes place on Saturday 28 July in Shane’s Castle, Antrim, from 9am-5pm. Equine entries accepted on show morning on the field. £15 late entry fees now apply. Show admission (payable at the gate) is £10 per person, where accompanied children under 16 years of age go free. Car parking is also free. Further show information is available at www.randoxantrimshow.com. Pictured are sponsors and directors of the Randox Antrim Show’s Equine section: Lesley Wilson, Moore Stephens Chartered Accountants; James Clements; Kristie Wilson and pony; Katherine Price, Randox; David Nicholl; and John Healy, Healy’s Haylage, sponsor of the new Working Hunter classes.